I can’t speak for all mothers, but for me, I feel like the majority of my life is centered around the needs of those around me. Don’t get me wrong, I’m SO not complaining as I have always had a serving heart even since childhood. It’s a big part of who I am. I’m a giver. I love to shower my loved ones with gifts, my affection and most importantly, my time/attention. I love that I’m the person my family and friends want to celebrate things with because I make them feel special. I love that I’m the one they come to for solutions and problem solving and I love that they know I will always listen and be ready to serve. One thing I’ve learned over the years about my personality trait is, usually the last person I am serving is myself. I tend to put my own nourishment, sleep, and wardrobe aside. I feel like A LOT of mommies do this, and over New Years, I decided to make a big change in 2016. I no longer had little tiny babies to take care of. Now that my boys are preschoolers, it seemed like the perfect time to shift a portion of my caregiving back onto me. Putting on my own “oxygen mask” first, so to speak! I kicked off my resolution with a major wardrobe overhaul that I posted about here. Taking the time to curate a closet that worked for my lifestyle and made me feel beautiful was such an awakening. So I decided, “why stop here?” And when I was approached by an old friend from my competitive cheerleading days asking if I was interested in trying out a new (to me) skincare line, I thought, “why not”? I’m really so glad I said YES because what it made me realize was that it’s truly easier than I thought to take care of my skin and to take a moment each day solely for ME. I’m a self proclaimed makeup and product junkie, but, I will admit, I haven’t taken amazing care of the canvas I’m painting. I would find an amazing product, get into a great routine, and then a few months later I’d be back to my old habits… Using only a makeup remover wipe as I was falling into bed. Fortunately, I have been blessed with fairly decent skin that put up with my neglect, but as I’m tip toeing the big 3-0, I began to notice there were certain improvements to be made. I wanted that “glowing from within” youthful look back (you know, the one you long for when you look back at pictures from your pre-kids days). I wanted the under-eye circles to disappear. I wanted to start preventing any wrinkles that were potentially on the horizon. 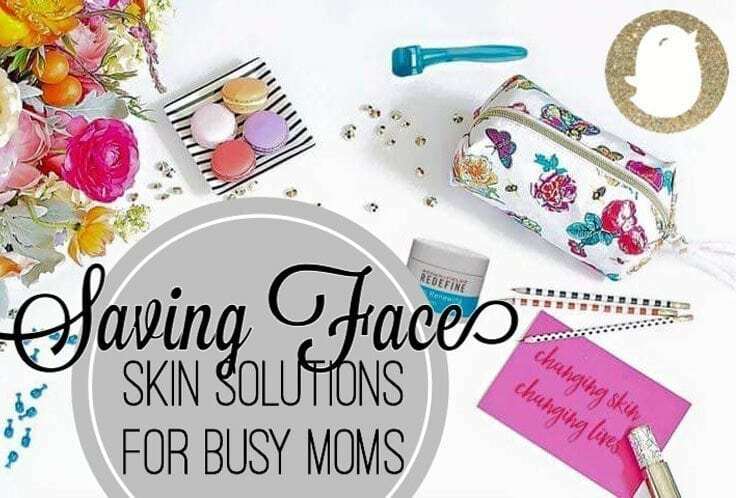 I’ve rounded up my top picks for saving face as a full-time mom. There are so many products in the Rodan + Fields line up that are amazing, but today, I’m sharing what you can use quickly and easily as a busy and on-the-go mama. So here’s what I’ve been up to! Full disclosure, I haven’t abandoned my beloved makeup remover wipes. That’s step (admittedly still) number one. We’re keeping it real around here! I then wash my face with Cetaphil, my forever favorite gentle cleanser. Post clean up, I do a quick once over with a needle roller. I received one years ago at Christmas from my aunt and never knew its full purpose until I was introduced to Rodan + Fields improved version (which I can’t wait to upgrade to!). The roller really allows product to work itself into the skin, which lead to better results. Honestly, you just have to try it and you’ll see what I mean. Everything absorbs better, you truly feel a difference. I think it’s something you need to experience and I promise you won’t go back! I’ve also gotten hooked on the Redefine Multi-Function Eye Cream. I put it on all around my orbital bone after using the roller and it really is like a little miracle worker. I sincerely think it’s a great product especially for exhausted moms like myself. Once a week, I take an extra few minutes to exfoliate using the R+F Microdermabrasion Paste. I absolutely love how smooth my skin feels after using this paste and that “glow” I mentioned earlier totally comes out after removing that dry and dead skin that’s getting in the way! My results speak for themselves. In this picture, I’m on the left, and while I’m wearing makeup, it’s a sheer and minimal daytime look and you can totally see my REAL unfiltered skin. The glow is back, there are no dark circles, and I get compliments on my skin all the time! I’m thrilled that by just taking a few moments for myself I’ve seen such a tangible improvement to the way my skin looks and feels. Saving my face and my sanity with a little self love is a big lesson I’m still learning as a mommy. Even those with a heart for serving others, working mamas, SAHM’s, teachers, nurses and beyond have to make a moment each day to give themselves some grace, a few minutes to relax and take care of that one accessory they’ll carry with them for life… Their skin! If you have any questions about what I’m using and want to know more about these products, contact your local R+F consultant and I’m sure they would love the chance to educate you more about the line and tell you their story and what R+F means to them! Tell me, what’s your nightly skin care routine look like? Could you use more “me” maintenance time? I would love to hear what’s working for you!